There is an abysmal degree of ignorance about the status of nuclear power in the country and what the Department of Atomic Energy (DAE) does, although in recent times anti-nuclear activists have been engaged in the herculean task of uncovering its programme and educating the public about this. This stems from the deliberate policy of secrecy and disinformation that the nuclear establishment maintains, helped in no small measure by a critical factor: DAE has been under the direct charge of the prime minister ever since it was set up in 1954 in the time of Jawaharlal Nehru who was a passionate proponent of atomic energy and its use as a nuclear deterrent if necessary. This ignorance and fudging is most evident when TV debates take place on the issue of nuclear power and the role it plays—or should play—in India’s energy security. While the powerful pro-nuclear energy lobby trots out its usual thesis that nuclear energy is an absolutely vital for India’s economic development, few in the opposite camp understand the economics and technology of this energy to provide a compelling counter-argument. Some basic figures are important to understand what is at stake. 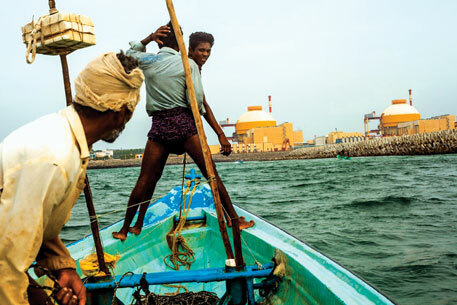 In the six decades since India began producing nuclear energy with foreign technology, technical assistance and funding (but more of this later) it contributes less than three per cent of the total power generation. Current generation capacity despite the massive funding that has gone into the programme is just 4,780 MW, that is 2.25 per cent of the total 211,766 MW. Even renewable energy, the ill- favoured stepchild of the power ministry, accounts for over 12 per cent of the total. This is the nuclear energy report card against the grandiose promises made by its champions that India would have 43,000 MW by 2000. Actual capacity then was just 2,720 MW! Yet this has not deterred Prime Minister Manmohan Singh from making the most extravagant and absurd promise of all—that we would have 470,000 MW by 2050. To help put all this in perspective, there is physicist M V Ramana’s The Power of Promise, which provides a splendid sweep of the history, economics and politics of nuclear energy in India since 1944 when Homi Bhabha set us on an ill-conceived trajectory to harnessing nuclear energy. In doing so, he exposes the many myths we have been fed on the nuclear dream and lays bare the huge lies that have been employed to make Indians believe that economic development is not possible without nuclear power. Ramana, who is currently at Princeton University where he works on two nuclear-related projects, is familiar to anyone who has been tracking nuclear power issues. He has written prolifically on the subject in newspapers and journals apart from an earlier book (Bombing Bombay?) and co-editing another, Prisoners of the Nuclear Dream. His articles have questioned the safety and economics of nuclear power plants, specially in view of the overt and hidden subsidies in their funding. 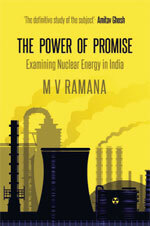 In The Power of Promise Ramana brings his vast research together in an authoritative volume that is eminently readable for its easy anecdotal style laced with sly humour. For instance, he begins his chapter of safety with a long, telling quote from the commander of the Titanic who boasts that: “I will say that I cannot imagine any condition which would cause a ship to founder. I cannot conceive of any vital disaster happening to this vessel.” That assurance of Captain Edward John Smith is similar to the absurd confidence of DAE on the safety of its reactors. As Ramana takes the readers through the accidents that have happened at Narora (most serious), Kakrapar, Kaiga and Kalpakkam, it becomes fairly clear that the design of the plants, the safety systems and emergency plans are such that Indians need to be worrying about the nuclear establishment’s safety claims. One of the core issues in India’s nuclear programme is the lack of fuel and the deep pockets necessary to fund such ambitions. India has precious little uranium and that’s how Bhabha formulated the famous three-stage programme (uranium in the first phase, then reprocessing the spent fuel to extract plutonium from a large number of breeder reactors and finally setting breeder reactors that would use uranium-233 and thorium of which India has abundant supplies) to bypass the problem. But this plan has a fatal flaw. Breeder reactors have not succeeded anywhere in the world and after decades DAE has little to show for all the money and time that it has been sunk in the project. The book catalogues the troubled history of this project with detail that scientists and technical experts would relish. Apsara was a research reactor and so was CIRUS which was set up with Canadian expertise and funding. What is fascinating is how the big powers were falling over themselves to help the nascent India state to become a nuclear power with Canadians channelling money under the Colombo Plan which provided development assistance to Commonwealth countries. As for the first commercial project, Tarapur I and II, it was General Electric which supplied the plant, the US government the fuel (enriched uranium) and other US multinational Bechtel that set up the plant. In fact, what emerges is Bhabha’s extraordinary skill in putting together such deals, including another with the Canadians for two reactors at Rawatbhata in Rajasthan, while overcoming the oppositions of the other giants of their time, Meghnad Saha and D D Kosambi. The latter argued passionately for focusing on solar energy but in vain. Similarly, heavy water plants were constructed at Nangal and Vadodara by a consortium of companies from the US, France, UK, Germany, Italy and Japan. However, Indira Gandhi’s Pokhran explosion of 1974 to test nuclear weapons ended the cosy relationship with the Western nations which imposed sanctions and left India out in the nuclear cold until the US-India nuclear deal of 2008. It is in these intervening decades that the real genius of Indian scientists and technicians for reverse engineering came into play and they began the painful crawl to setting up indigenous plants. DAE ought to be squirming over such revelations but given the power of mythmaking that has resulted in self-hypnosis I doubt anyone in that organisation would even be blushing. What should add to their discomfiture are other chapters on the different fuels and reactors, all of which show on what shaky foundations India’s hunt for nuclear energy is based. The Power of Promise is almost everything one needs to understand critical aspects such as costs, safety issues and environmental implications as India embarks on an ambitious programme to import foreign reactors in the wake of the poor capacity addition through the indigenous route. Ramana’s contention is that the rapid and large-scale expansion of nuclear power envisaged by DAE is that “it is very unlikely and probably impossible”. But nuclear energy promises something that a safer alternative like solar, which has the same potential to generate vast amounts of energy as nuclear without facing fuel constraints, cannot offer: the ability to produce the means (weapons-grade plutonium) for building a nuclear arsenal. And here rests its biggest charm for governments and hawkish scientists.